14.12.017 Dortmund / FZW w/ StrgZ, Venerea u.a. 21.10.017 Chemnitz / AJZ Talschock-Mushroom Garden w/ Coogans Bluff u.a. 07.01.017 Leipzig / LE Heat Festival w/ Rotor, Dampfmaschine, Deamons Child, a.o. 22.08.015 Arendsee / Rockt den See w/ Neume, Mother Engine u.a. 01.08.015 Stolzenhain / E-Lite-Culture w/ Rotor, Mandala, Neume u.a. 24.05.013 Grimma / Crossover festival w/ Dyse, Honnigbarna u.a. 09.05.013 Hamburg / Hafengeburtstag w/ Bottrops, Hard Skin u.a. 01.05.013 MyFest / Trinkteufel Bühne w/ H2O u.a. 08.09.012 South of Mainstream Festival w/ The Obsessed, Ostinato, COR u.a. 25.08.012 Dresden / Hechtfest Tannenbühne w/ Gaffa Ghandi u.a. 10.03.012 Dresden / Born Wild Fest w/ Samsara Blues Experiment, Mother Engine u.a. 08.10.011 Cottbus / Blue Moon Festival w/ Whithe Hills. Dixie Witch, Roadsaw u.a. 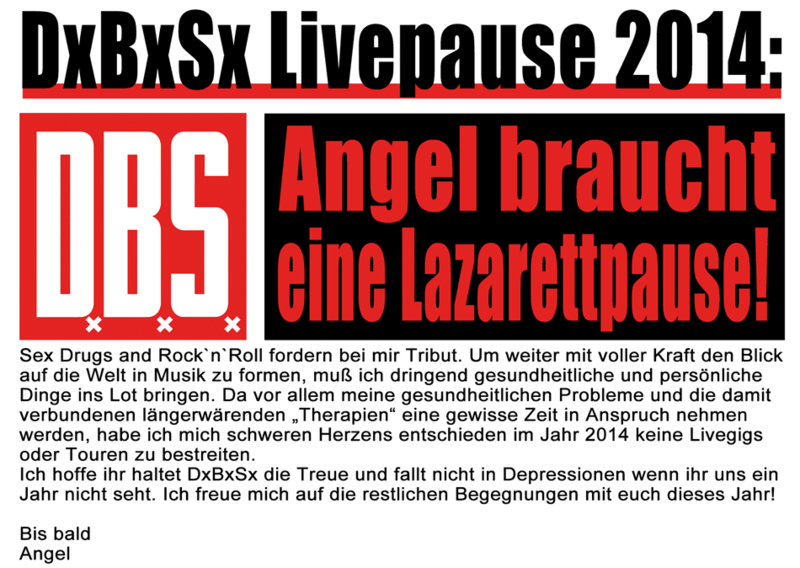 20.08.011 Arendsee / Rockt den See w/ .zed, Samsara Blues Experience, White Buzz, u.a. 06.08.011 Luckenwalde / Sky Way Jam w/ This is Ghost Country, u.a. 07.07.011 STONED FROM THE UNDERGROUND w/ Valient Thorr, EyeHateGod, Monster Magnet u.a. 01.07.011 ROTORMANIA w/ Rotor, Coogans Bluff, Dyse u.a. 29.10.010 Berlin / WhiteTrashFastFood w/ BOLLOCK BROTHERS u.a.